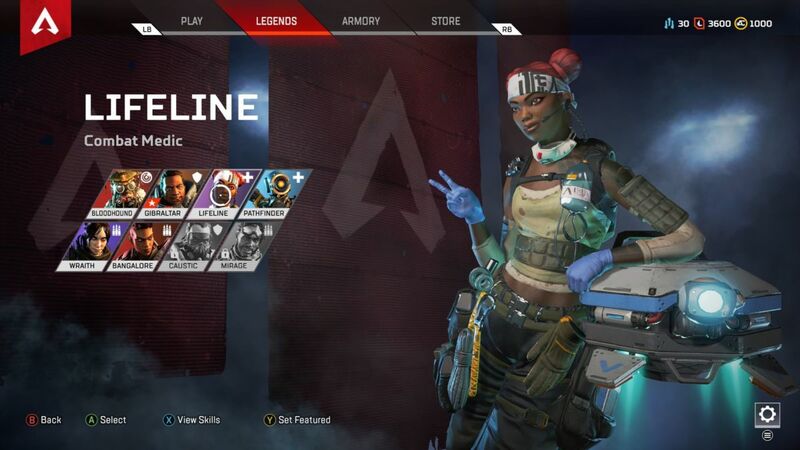 Apex Legends is not much different from other battle royale games when it comes to rules and regulations. Similar to other games, in Apex Legends, squads try to be the last one standing on the ground by eliminating enemy teams. Loot like weapons and ammunition is gathered after deployment. Every player is dropped in same condition (with no armor and weapon). But the major reason, people are enjoying this game so much is due to the introduction of heroes with each of them having unique abilities in their arsenal. Some are good at support like Mirage while some are good at offense like Wraith. With so many choices in hero selection, players can get confused which character would suit their playstyle best. Obviously, you can discover this by playing with each hero for some time. But you must have a basic idea about heroes’ abilities so you can tackle enemy players when they try to use special abilities. Lifeline is another one of those support characters in the game who can help squad big time rather than being overpowered as an individual. This hero posses some great supporting abilities; which if used smartly, will give a strong advantage to your team. She is not very good when it comes to offensive abilities though. This article will guide you about Lifeline’s skills and how you can use them to your team advantage. Lifeline is the only medic character in the game and that is why you will see her in a lot of teams. She can make big difference in difficult situations by using the healing skills like reviving teammates and granting them strength to get back up on their feet. Her supporting arsenal lacks the attacking qualities but at times, these skills can be more useful than offensive ones. To play with Lifeline is to stick together with your teammates. If you want to choose her as your hero for the match, don’t stray away from your teammates for too long. Also, do not try to be a hero and meet enemies on the front line. She will get knocked down easily and won’t be any good any more. In Apex Legends, multiple heroes possess the ability to escape dangerous situations. Like Wraith can create a portal to teleport from one place to another and Mirage can deploy clown to trick enemies but sadly Lifeline is not one of them. If trapped, she won’t have anything special in her backpack to escape the tight situation. So, you must be smart while playing with Lifeline because she can easily become a liability, if not used correctly. Perhaps the best ability in her arsenal. Lifeline’s Combat Medic is a protective shield that can be drawn in front of her while she revives her teammates. In battle royale game, it is very difficult to revive your squad under continues fire. But not for Lifeline, she can easily revive her teammates while the shield will protect her from enemy bullets. This ability can be extremely useful for the squad. Also, she revives knocked down teammates much quicker than other heroes. Heal drone has a limited health storage that can be dished out in if multiple players (present under its radar) need healing. It can also heal enemy players under the healing radar. Considering these two points, you should be more careful on where to deploy the drone. Lifeline can use the ultimate ability to call a care package anywhere. This care package might not contain extra-ordinary weapons. Still, it will be loaded with defensive equipment like high level armor and sweet weapon attachments. You should use this ability as soon as it is loaded. In the battle royale game mode, players can die anytime. So, it is better to have best gear equipped rather than saving it for the end game. Now you have the basic idea about Lifelines abilities. Try to apply these tips in the match. Lifeline can heal your squad much faster than normal heroes but she is not a soldier to lead the group against enemies. The player who is using her should stay between the squad and always be ready to provide medic support to teammates. Another important tip would be to use sniper rifles with Lifeline. The more she will be afar from enemies, the safer she’ll be. And don’t forget to use ULT ability. It can be game changing for any heroes and Lifeline is no less in this regard. If you have any other tips that you want to share with us. Do tell in the comments.